The launch of the Chevy Volt (s gm) and the Nissan Leaf have helped spread the gospel of electric cars, but consumers won’t convert without knowing there’s an abundance of charging stations. The federal government, which is arguably the biggest booster of electric cars, announced two initiatives on Tuesday intended to kick-start the EV ecosystem: a Google (s GOOG) Maps-led effort to provide consumers with location data for charging stations nationwide, and an award of $5 million for cities that come up with plans to popularize electric cars. The National Renewable Energy Laboratory is working with Google and others to create a national clearinghouse of sorts for charging station data and services to serve consumers, said the U.S. Department of Energy. The effort, which uses the decidedly un-consumer friendly term of “electric vehicle supply equipment (EVSE)” to describe charging stations, uses Google Maps as the “primary data source for GPS and mapping services” to track charging station locations. The DOE would like makers of cars and navigation systems to use this service to contribute to and use the database as well. Some charging station network owners, such as Coulomb Technologies, also provide an online map of their stations for consumers. And startups like Xatori are looking to build a business around sharing charging data and a mobile app. The database isn’t new and already contains data for thousands of public stations for alternative fuels such as biodiesel and hydrogen. But it provides not only a list of fueling stations nearby, but also a way to map the route to get to those stations. 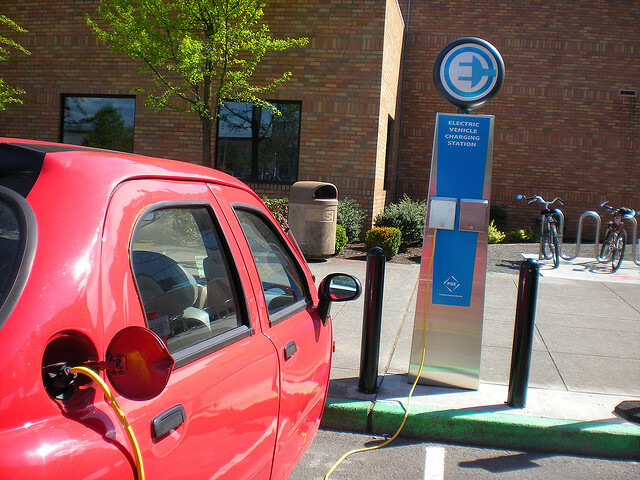 The DOE also announced a plan to award $5 million to cities that come up with good plans to make it easy to deploy charging stations, from changing their permitting processes to offering incentives. The DOE is touting this new pot of money as part of a long-standing Clean Cities program to corral local governments to support cleantech deployment, including greener transportation fuels. The program, which also involves private industry, has saved nearly 3 billion gallons of gasoline, the DOE said. “The federal government can’t do this alone, and it’s nice for the local governments to have a partner” in promoting electric vehicles, said Christopher Coleman, mayor of St. Paul, Minn., during a conference call. The federal government has poured in billions of dollars in the past two years to try to transform the auto market and nudge consumers toward choosing more fuel-efficient cars. The money has gone to makers of cars, batteries and other equipment to build electric cars, as well as to developers and owners of charging stations. The DOE is funding established players such as General Motors and LG Chem and newcomers such as Tesla Motors (S TSLA) and A123 Systems (s AONE). During his State of the Union address in January this year, President Obama said he wants to see 1 million electric cars on the road by 2015. The DOE then issued a report outlining how a mix of incentives and tighter fuel economy standards will make this goal a reality. For electric cars to go mainstream will take a few decades, though. Analysts are expecting electric cars to make up about 2 percent — or a little more — of the world’s car market by 2020. Photo courtesy of Adventures of Pam & Frank via Flickr.